Chimney Cake (kurtoskalacs) is one of the traditional Hungarian cakes, originally made by Hungarians living in Transylvania (now in Romania). Chimney cake is a lovely sweet snack, a must try at the Budapest Xmas Markets, loved by kids and adults. Chimney cake is the sweet rock and roll pastry for Hungarians. Pretzel for the salty, Chimney cake for the sweet. A walking snack, and a sight to behold as it is made in front of your eyes (and nose!). 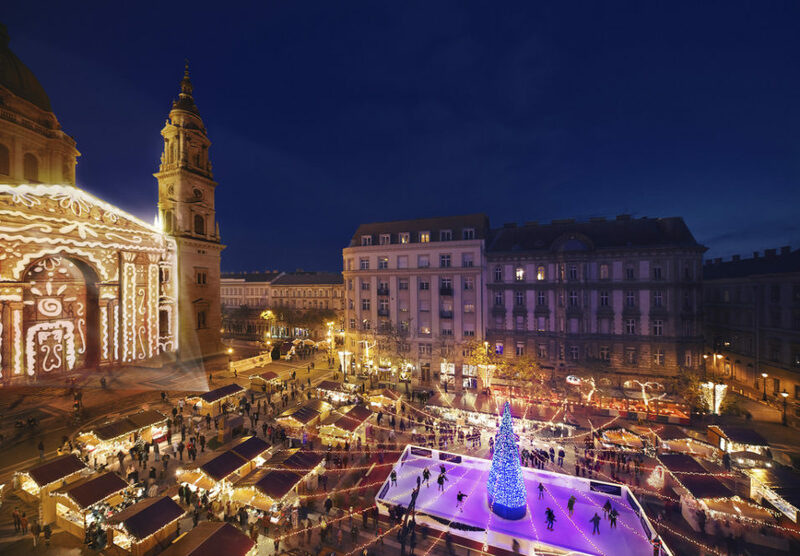 While we consider Chimney Cake a sweet delight during winter time in Hungary, it is not a special Christmas pastry (unlike Beigli), and can be bought all year round, especially at Budapest festivals, like the Festival of Folk Arts in Buda Castle in August. 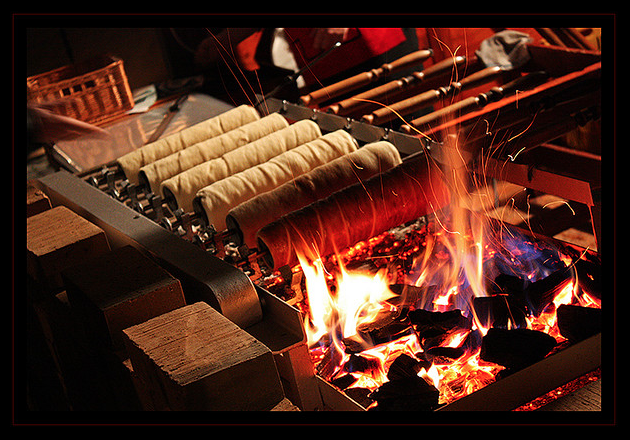 You can walk around the Christmas market with your warm and delicious Chimney cake: milk bread grilled over open fire. You can pick a flavour too: cinnamon, almond, walnut, coconut, etc. There are lots of yummy versions of Kurtoskalacs. No worries, the vendors will speak English. But if you wonder what the pronunciation of Kurtoskalacs is, let’s see how you say this yummy mouthful word: cure-tosh-col-arch. Not so hard, right? 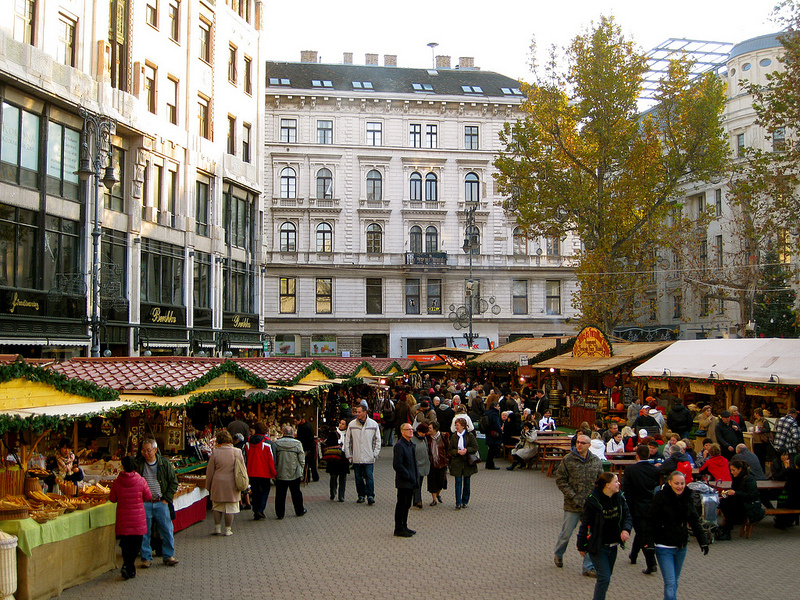 It is sold at a more expensive price at the market (as all foods and drinks), but considering that there is no entrance fee to the Christmas market, it is not so pricey after all (about 4 Euros per roll, which could be 1-2 Euros otherwise…). So we shut our eyes, and roll with the Christmas: we love to nibble a freshly baked Chimney cake on the Christmas market, and have our mulled wine too! The dough is basically a sort of milk loaf baked and rolled in cinnamon, cocoa powder, etc. Once the dough has raised and is ready to bake, it is thinly stretched by a rolling pin, cut in slightly to make a snake like strip of the dilapidated dough, then quickly rolled on a thicker wooden rolling pin, which has a metal handle and a metal hook. The dough on the pin is then baked in an open fire over the glistening coals. Once the cake is baked, and has a nice brown coating, it is slipped off the thick wooden rolls. The cake looks like a little barbecued pipe, or the chimney stack of old times. Hence the name Chimney Cake (Kürtős kalács in Hungarian). The cake roll gets its final flavors when it is rolled in the sugary mixtures of cinnamon, cocoa, ginger, etc. The rolls are sold in packages too. It won’t be as delicious if eaten later, and delivered in a plastic wrapping, but it could be one of your Hungarian culinary gifts – some food for thought.